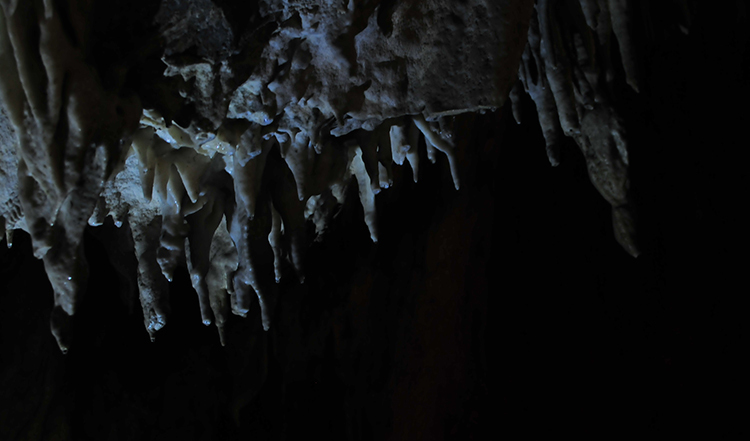 The white stalactites hanging from the roof of the cave are called “stone icicles”. They are tubular stalactites shaped (just like a straw, and so also referred to as soda straws or straws) and most of them continue to grow longer by gradually enlarging their tube perimeters. In cross-section, an stone icicle usually looks like a tree’s annual growth-rings. This pattern is made by thinly deposited clay, carried in the groundwater, left on the surface of an stone icicle during its formation. 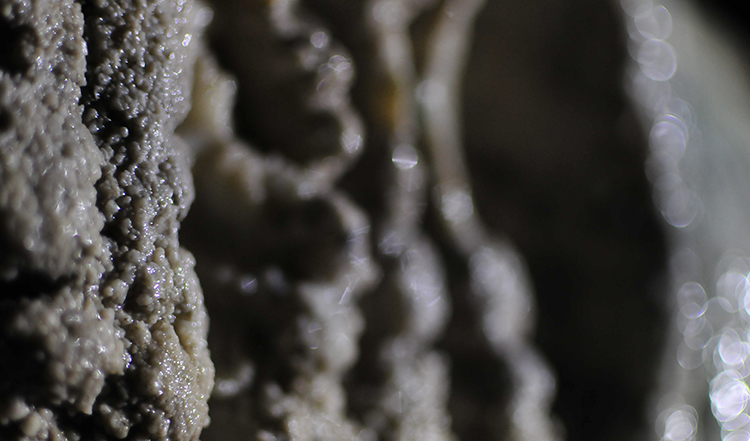 This describes the small granular (or popcorn shaped) stones that form everywhere in the limestone cave. Because its shape is similar to that of sea coral, it is called “cave coral”. 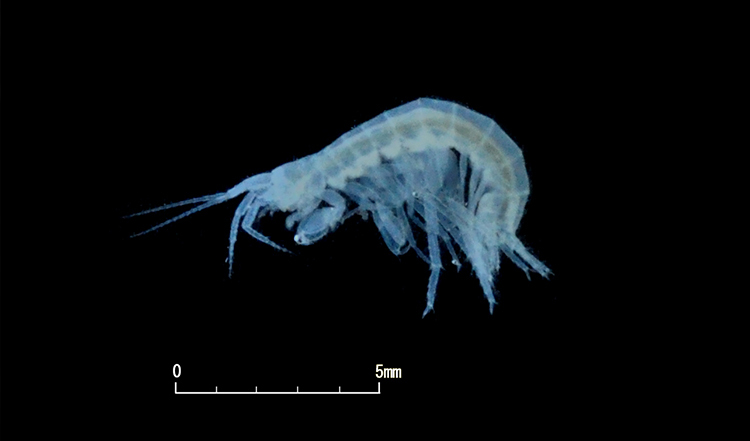 This is most usually seen on the cave wall. When lime, contained in the water droplets falling from the tip of the stalactites, is precipitated onto the cave floor it gradually takes a form like a growing “bamboo shoots”, and is called “stalagmite” (or stone bamboo in Japanese). When the water flows very gradually over a gentle slope, many water pools or small dams may form. The appearance resembles rice terraces, and a ridge of such ‘terraced rice fields’ is called a rim stone, while the ‘paddle’ surrounded by the rim stone is called a rim stone pool. The depth of the rim stone pools varies from several centimeters, for a small size pool, to several meters for a large one. The rim builds up when calcium carbonate precipitates from the thin stream of overflowing water around the ridge. 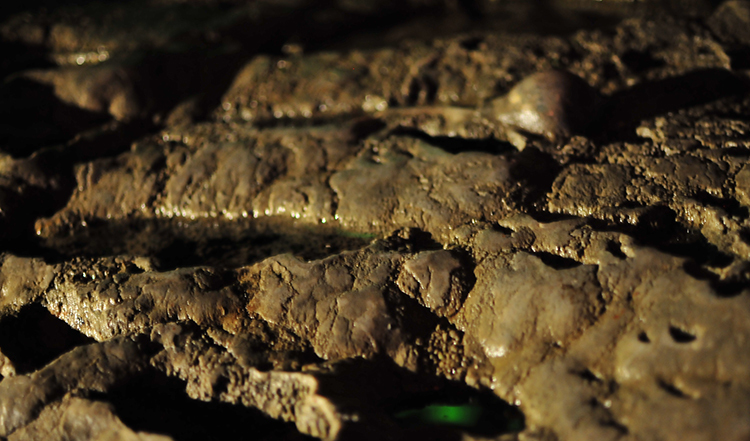 In Ryusendo Cave, you can enjoy the sight of such rim stones on a small scale. 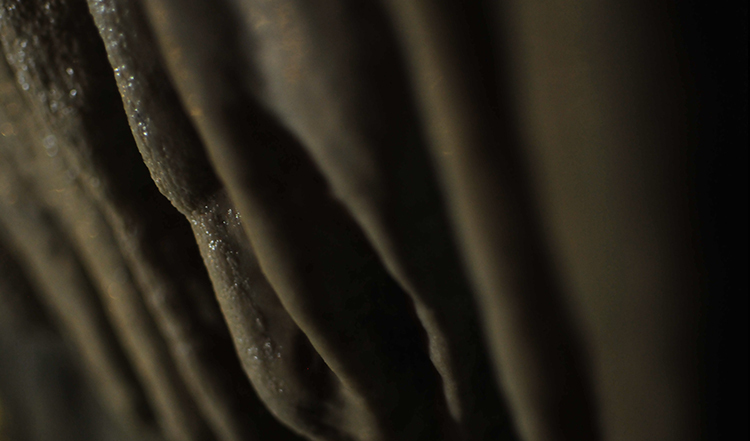 Flowstone is made of lime, contained in the flowing water, which crystallized and covered the cave wall. It was so-called because the stone’s contours, created over time, look like flowing water. When a downward-extending stalactite and a upward growing stalagmite join together over a long time to take a pillar form, the result is called a “stone pillar”. Thus stalactites, slowly growing, gradually fill the space in the cave. Bats are the only mammals that can really fly. While there are two types ? fruit bats and insects-eating bats, only the latter type inhabit in the Iwate Prefecture. Also bats roosting in the cave form two groups: those who hunt food outside at night and rest in the cave in daytime, and others who rest in daytime in the forest in summer, but only hibernate in the cave in winter. In winter, hibernating bats hanging upside down from the roof of the cave can be seen here and there. Bats have super-sensitive hearing and detect obstacles and prey while flying in the dark by emitting ultrasonic pulses inaudible to human and then using the echo to create a “sound-picture”. 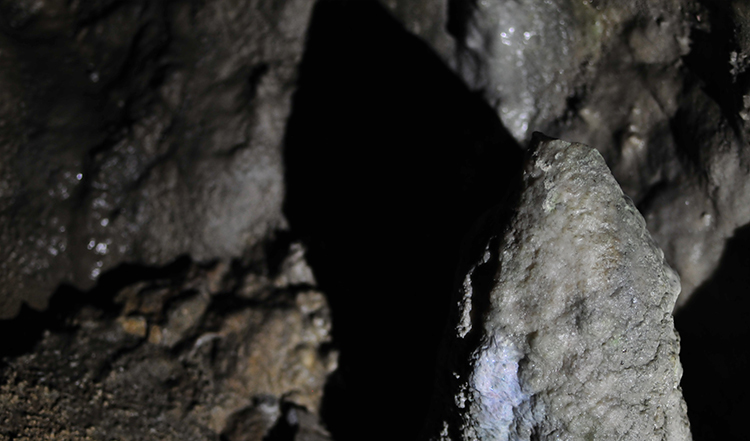 This is called echolocation, and using this faculty, bats rarely collide with humans in the cave. 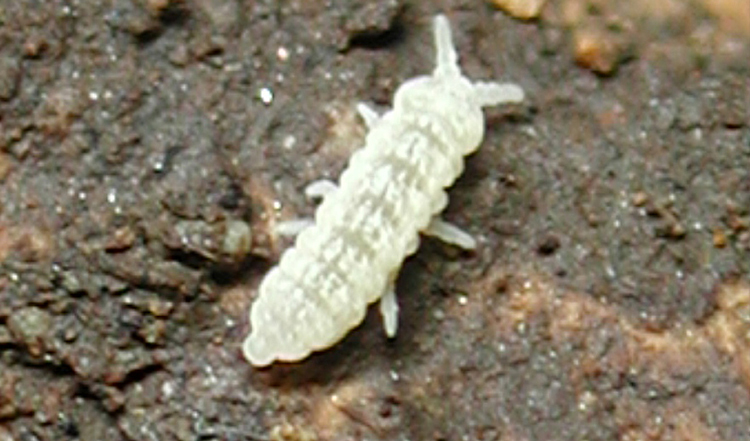 Springtails are primitive insects of several milimeter long, and jump using a mechanism called furcula (leaping mechanism) below its 4th abdominal segment. 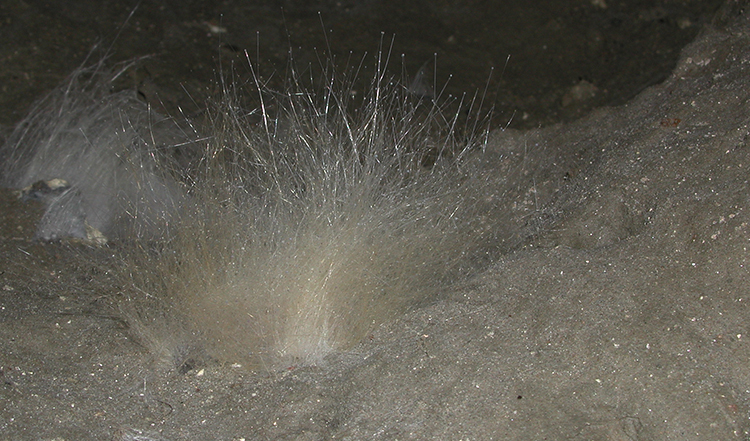 Various fungi are also growing in the cave. 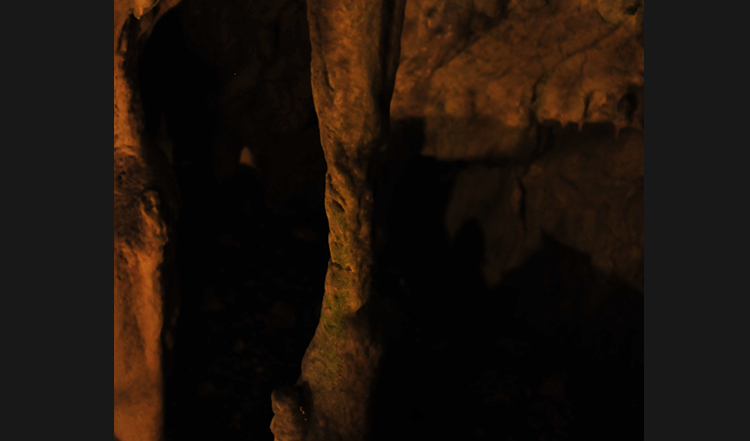 Fungi, such as those that grow in guano (bat droppings), form a source of food for other microorganisms in the cave, and in this way the food chain is completed.